Adilabad District Cooperative Central Bank Recruitment 2019 For both Fresher and Experienced Candidates updated on January 8, 2019. 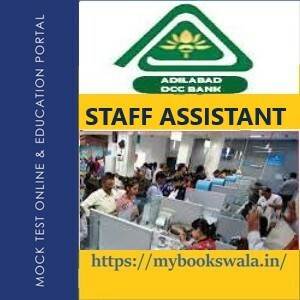 · Free Sample Test Papers of Adilabad Central Bank Staff Assistant Exam without any cost. · Buy 100+Mock Test Series of Adilabad Central Bank Staff Assistant Exam Only 30.00 Rupees. · Test Paper Of English Language with Vocabulary, Synonyms, Sentence Rearrangement, Comprehension, Error Correction, Answering questions based on Unseen Passages, Fill in the Blanks with Modals, Articles etc. · Buy Mock Test Paper and Get Free Soft copy of complete courses on your Registered Email Id.